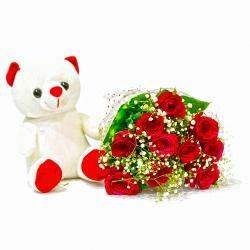 Product Consists: Bouquet of 20 Red Roses along with Teddy Bear (Size : 6 Inches). You will cherish this lovely combo on special occasions like Birthday, Anniversary, New Born, Janmashtami, and valentines day among others. This contains a beautiful bunch of twenty red roses which are neatly packed in cellophane and adorned with a complementary ribbon bow tied onto the same. This combo also comes with cute teddy bear. 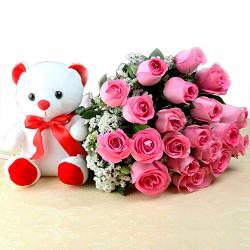 This combo will certainly be a fabulous gift for your dear one, friends and family in India. 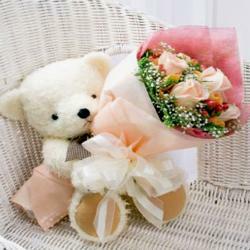 You can send this amazing flower bouquet on any occasion and festival with other Gifts to India through Giftacrossindia. 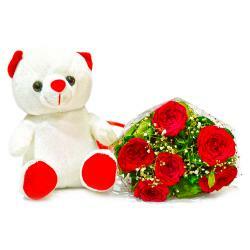 This gift hamper contains : Bouquet of 20 Red Roses along with Teddy Bear (Size : 6 Inches).